What does one say about a movie that does nothing at all to you, that doesn't even give you a headache to register its painful presence? 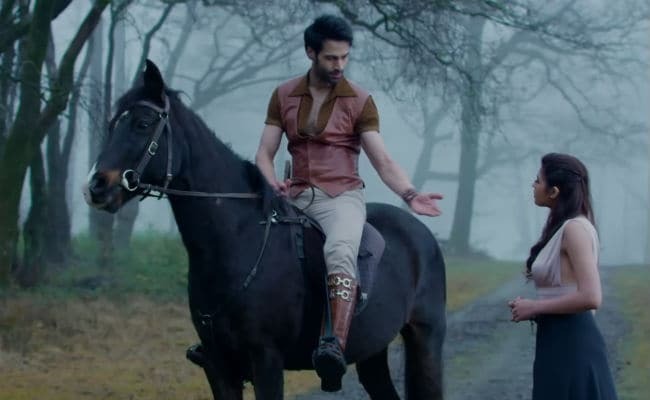 Ek Haseena Thi Ek Deewana Tha is one such film - a hollow puff of air that wafts by aimlessly, takes all of an hour and three quarters doing so, and is interspersed with a complement of songs that only serve to slow down an already somnolent show. You've guessed it, it isn't a pretty spectacle. Ungainly ghosts from the past sit astraddle the shoulders of this Haseena and Deewana duo. The title of the film - borrowed from a cult number in Subhash Ghai's 1980 reincarnation drama Karz - is only one of them. There is much else in Ek Haseena Thi Ek Deewana Tha that revives memories of Hindi cinema's yesteryears in ways that are cringingly awkward. With the exception of debutante Natasha Fernandez, who on her part does little to inject freshness into the film, all the major names in the credits are of men making a comeback: producer-director Suneel Darshan, lead actor Shiv Darshan, key cast member Upen Patel and music composer Nadeem, the man who, with creative partner Shravan, held sway over the Bollywood music scene in the 1990s. It isn't any surprise that Ek Haseena Thi Ek Deewana Tha does not have anything new to offer? A single sentence would actually suffice to sum up what this film is like: it hinges on a weirdly nonsensical plot treated in a manner so bizarre that, kasam paida karne wale ki (for whatever it's worth), it would make some of the sloppiest Mumbai films of the 1980s look great in comparison. The robotic acting all around only makes matters worse. When an actor proclaims with all the earnestness at his command: "Yaadon ki zameen khodne par sirf ateet ki kankaal nikalti hai (roughly translated: digging for memories will only expose skeletons of the past)," he sounds like he is giving helpful directions to a lost wayfarer. Ditto when another of the characters announces: "Tumhari judaai mujhe jeene nahi degi aur tumhara intezaar mujhe marne nahi dega." The story, revolving around a woman torn between her fiance and her newfangled lover, has a fusty once-upon-a-time feel that is instantly at odds with the easy-on-the-eyes English countryside where much of the film's action is set. It echoes long-mothballed generic conventions and resorts to plot devices that popular Hindi cinema learnt to jettison many, many years ago. Ek Haseena Thi... is about a conspiracy to kill a wealthy heiress, a pyaar ka drama aimed at putting the nefarious scheme into practice and plenty of divine interventions. While it is absolutely clear from the very outset who the intended victim of the foul play is, the audience is kept guessing with regard to who the mastermind could be. But when all the cards are eventually laid on the table, it turns into a grotesque endgame. The haseena here is little rich motherless girl Natasha (Natasha Fernandez), who has inherited a sprawling medieval manor. With her fiance Sunny (Upen Patel, back in a Hindi film after 2009's Ajab Prem Ki Ghazab Kahani), she makes a trip to the enviable property to prepare for her wedding scheduled for a month later. The well-laid plans of the pair go haywire when the girl is drawn to a poetry-spouting farm boy Devdhar (Shiv Dhawan, in relaunch mode following a 2014 false start, Karle Pyaar Karle), the deewana of the title. As the fling assumes serious proportions, secrets buried deep in the chambers of time bubble to the surface and unleash a chain of events that endanger lives. The resultant complications throw all three into an emotional vortex that goes back and forth between the tense and the intense without making any sense. The film is shoved in the direction of loads of mumbo-jumbo about unrequited love, treachery and a wandering spirit determined to claim what was found and lost in a previous birth. Obsession, when dealt with in the context of a timeless span, gets spread too thin for its own good and gets completely drained off the passion that it needs in order to heave itself forward at an engaging clip. Ek Haseena Thi Ek Deewana Tha never gets anywhere near achieving any manner of equilibrium. This love story of a man supposedly long dead is as comatose as a cadaver. Ek insaan aur ek aatma kabhi ek nahin ho sakte, says one character to another as nonchalantly as if he were placing an order for a burger. He doesn't bat an eyelid and neither does she. But the aatma of cinema, which is under frontal attack here, writhes in pain. Upen Patel has made umpteen attempts to get going in Bollywood. He was part of the cast of the last film that Suneel Darshan directed all of a decade ago, Shakalaka Boom Boom. It went bust. Add Ek Haseena Thi Ek Deewana Tha to the actor's list of duds. Both Shiv Darshan and Natasha Fernandez are clearly in need of brushing up their emoting skills and dialogue delivery before they have another stab at a substantial screen role. May be the collective poor showing of the actors here isn't entirely their fault: Ek Haseena Thi Ek Deewana Tha is a train-wreck of a movie. It would have been better off staying on the computer screen it was scripted on. That would have spared the actors the blushes.